Use ArcGIS License Manager to authorize Concurrent Use licenses. ArcGIS License Manager software is included in your ArcGIS Desktop license. It is required both to authorize Concurrent Use licenses and to manage the check-in and checkout of licenses once they have been authorized. More information can be found in the ArcGIS Desktop help topics Installing the license manager, About the license manager, and License manager installation and startup. To authorize ArcGIS Pro 2.3 Concurrent Use licenses, you must install ArcGIS License Manager 2018.1 or later. Close any open applications on your computer. Sign in to My Esri with your Esri Account credentials. At the top of the page, click the My Organizations tab. Under the My Organizations tab, click the Downloads tab. In the Quick Search box, type ArcGIS License Manager and press Enter. In the list of search results, for ArcGIS License Manager 2018.1, click View Downloads. On the ArcGIS License Manager download page, make sure the version is 2018.1 and the language is set correctly. On the Download Components tab, identify the files you want: either ArcGIS License Manager (Windows) or ArcGIS License Manager (Linux). In the Action column, click Download. In the Download Manager window, click Click to download your file now. When the download is complete, browse to your default Downloads folder and double-click the ArcGIS License Manager .exe file. Follow the prompts to install the license manager. When the license manager is installed, the ArcGIS License Server Administrator dialog box opens automatically. On the ArcGIS License Server Administrator dialog box, in the directory tree on the left, click the Authorization folder. On the right, click the version drop-down list and click ArcGIS Pro 1.2–2.3. Click Authorize Now to open the Software Authorization Wizard. If you did not create a provisioning file when you converted licenses, under Authorization Options, accept the default option: I need to authorize licenses on my license server. If you created a provisioning file, click the I have received an authorization file and am now ready to finish the authorization process option. Click Browse and browse to the location of the .prvs file (for example, your Downloads folder). See Provisioning files for more information. Under Product to be Authorized, click ArcGIS Pro. Click Next. On the Authorization Method page, accept the default option: Authorize with Esri now using the Internet. Click Next. If you don't currently have Internet access, click Authorize at Esri's website or by email to receive your authorization file. Follow the prompts to fill out the form and save it as a text file. See Authorization files for information on how to complete the process. On the Authorization Information page, confirm that your contact information is correct. Click Next. On the Authorization Information (continued) page, confirm that your organization, industry, and job description are correct. Click Next. 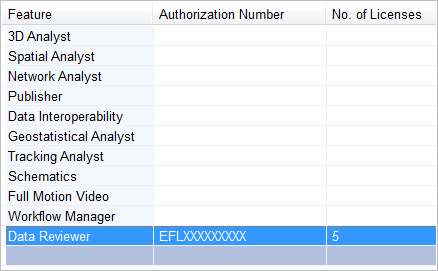 On the Software Authorization Number page, enter the authorization number in the appropriate box, according to whether you converted Advanced, Standard, or Basic licenses. In the No. of Licenses box, enter the number of licenses you converted. Your authorization number and the number of converted licenses are available from the My Esri portal or in an email sent to you from My Esri. On the Authorize Software Extensions page, accept the default option: I do not want to authorize any extensions at this time. If you want to authorize extensions, click the I have authorization number(s) to authorize one or more extensions option. Under Extensions, provide the authorization numbers and number of licenses for the extensions you want to authorize. See also the Authorize an extension section below. The ArcGIS License Server Administrator dialog box remains open. On the ArcGIS License Server Administrator dialog box, in the directory tree, click the Availability folder. The total number of licenses is shown along with the number currently available. When a user starts ArcGIS Pro Basic with a Concurrent Use license, the number of available licenses will change from 5 to 4. To see which user has checked out a license, click View License Usage. Click OK to close the ArcGIS License Server Administrator dialog box. You may need to authorize one or more extensions after ArcGIS Pro has already been authorized. First, you will need to convert one or more Named User licenses for the extension product in My Esri. Follow the same process you used to convert core product licenses as described in Convert Named User licenses to Concurrent Use. Once you have the authorization number, proceed with the steps below. The workflow is similar to authorizing the core product. On the Authorization Options page, click I have already authorized core licenses and need to authorize additional extensions. On the Authorize Software Extensions page, under Extensions, enter the authorization number for the extension you are authorizing. In the No. 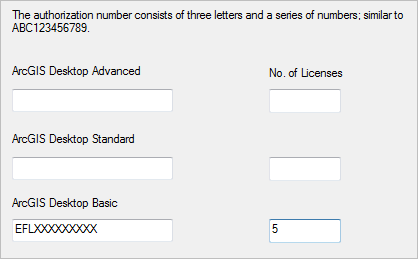 of Licenses box, enter the number of licenses. When the process finishes, a message on the Software Authorization Wizard dialog box confirms that your software has been authorized and is ready for use. The total number of licenses is shown along with the number currently available.